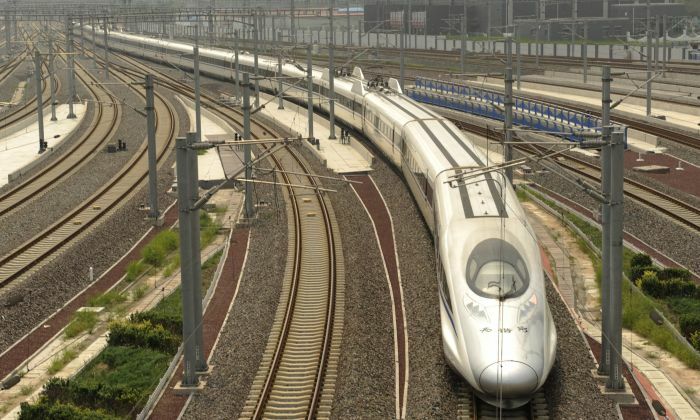 Zhao Jian, a professor at Beijing Jiaotong University and railway expert, recently expressed alarm at the unsustainable finances of China’s high-speed railway system, remarking that it was an economic “gray rhino.” The term is used to refer to an obvious yet ignored threat. Beijing Jiaotong University is China’s top university for transportation science and technology, according to an academic ranking conducted by ShanghaiRanking Consultancy in 2018. The school receives funding from China Railway (formerly China’s Ministry of Railways, now a state-owned firm), city governments, and metro companies all around China. Zhao has worked for Beijing Jiaotong University since 1982 and has led several rail projects with the former Ministry of Railways. On Jan. 28, Zhao published a commentary on Caixin, a Chinese business magazine. The article, titled “Beware of the Gray Rhino That Is the High-Speed Railway,” pointed out that the development of the country’s railways was not healthy, given the high investment and low returns. “The Lanzhou-Urumqi high-speed rail has the capability to operate more than 160 trains every day in each direction, but only has four running daily [due to lack of passengers]. The revenue is not even enough to pay the electricity bill,” Zhao wrote. Urumqi is the capital of Xinjiang, a provincial-level region located in the most northwestern reaches of the country. This area is relatively underdeveloped and lacks road infrastructure. Lanzhou City is the capital of neighboring Gansu Province. Ground transportation connecting Xinjiang to the rest of China must pass through Lanzhou. Zhao explained that despite the existence of a high-speed rail, the trains are unable to transport cargo. Instead, for cross-province transport, the Xinjiang region relies on trucks. “China’s high-speed railway can only transport passengers, not goods. And certainly not tanks or missiles,” Zhao wrote. Zhao elaborated that the trackbed, tracks, power supply system, train cars, and other parts of the high-speed railway system are designed for transporting light weight and cannot support goods transport. Xinjiang’s reliance on trucks has caused heavy air pollution. “Diesel trucks are the largest emitters of PM [particulate matter] 2.5, and trucks that run on natural gas emit even more NOx [oxides of nitrogen] than diesel trucks,” Zhao wrote. The railway expert added that this is the case not just in Xinjiang, but in the whole of China. “The total operating length of China’s rails is only 130,000 kilometers. 29,000 of them are high-speed rail that can only transport passengers,” Zhao wrote. The Chinese regime has touted the high-speed rail as a great service to the populace. But Zhao said the reality is: the annual average transportation density of China’s high-speed railway is 17 million people per kilometer, compared with 90 million people per kilometer in Japan’s Tokaido Shinkansen rail. In addition, ticket prices for riding the high-speed train is three times that of normal trains. The majority of Chinese are not willing to fork out the extra money for the speed and convenience of high-speed rail. Despite knowing that there is not enough market demand for high-speed rail, the Chinese regime plans to continue investing in 2019. Japanese business magazine Nikkei reported on Jan. 21 that China Railway plans to invest 850 billion yuan (about $126.25 billion) on railways this year. With this investment, China will build 6,800 kilometers of railways, 3,200 km of which will be high-speed rails. Zhao also noted that the railway system is in huge debt following the construction of high-speed rails, ballooning from 476.8 billion yuan in 2005 to 4.72 trillion yuan ($701 billion) in 2016. “Even without considering the operation costs, the total revenue from ticket sales is not enough to pay interest on the loans,” Zhao wrote. “By the end of September 2018, the total debt of China Railway had reached 5.28 trillion yuan ($784.2 billion). The former Minister of Railways, Liu Zhijun, is being charged with corruption.